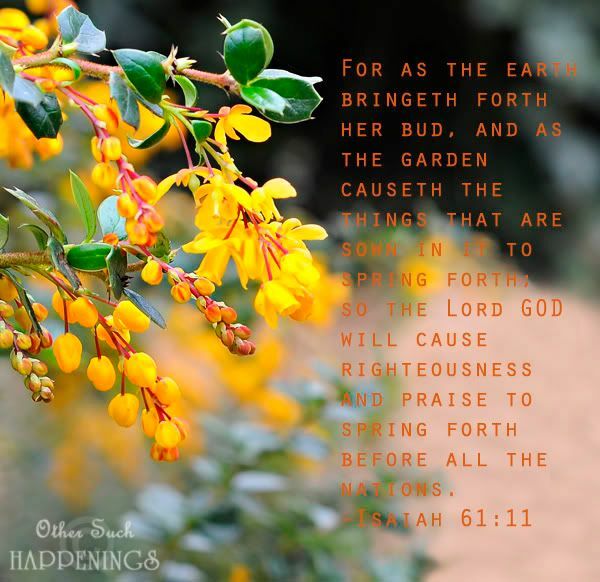 We are studying Isaiah this year in BSF. I love the colors in this photo. Beautiful! Could be your sweet shot also. Ever since you mentioned this I thought I'd want to try it. I love that shot! wow...gorgeous. BEAUTIFUL! Beautiful scripture, beautiful shot! Thank you so much for joining in this week!! Thank you for the comment on my blog. Excellent job on this shot! 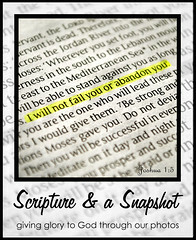 Love the picture and scripture! Beautiful example of this verse.. I often pray this verse for our country and those that do not know my Jesus. Such a beautiful promise. The photo just magnifies the Truth of God's Word. What a great idea for a photo challenge!! I love, love, love the colors in this picture. The actual flower and then your text also. Beautiful! And the verse...well it just speaks for itself. Righteousness AND praise...wow!!! I love God's word! Beautiful shot. I love this verse, it speaks of our god in such an outstanding way. Love this, Marsha!! The picture, the verse, ... the colors that remind me of fall - it's all so lovely! Thanks for sharing!